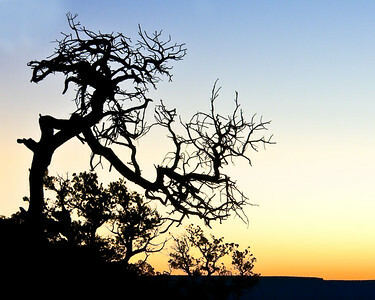 Taken from the top of Desert Point, a silhouetted view of a raggedy old tree, looking into the Grand Canyon sunset in 2010. 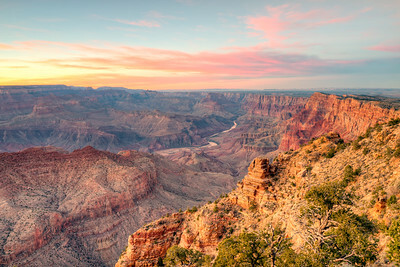 Desert View is one of the best places to watch the sunset in the Grand Canyon. 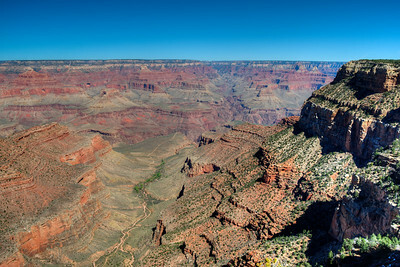 You get a good deep look into the canyon, but it is a fair distance from the Village, if you are entering the park at that point. Be warned, it is a good drive away. 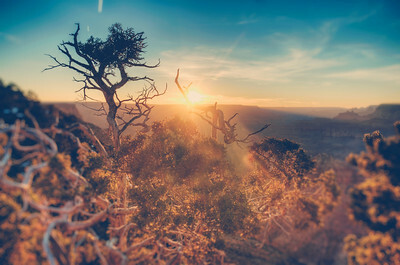 Arizona, 2010. 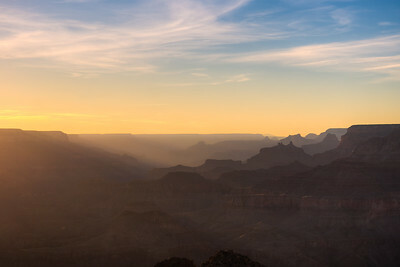 A sunset view looking deep in the Grand Canyon, looking west from Desert Point, as the sunset rays create layer after later of silhouetted peaks. Amazing place, 2017. 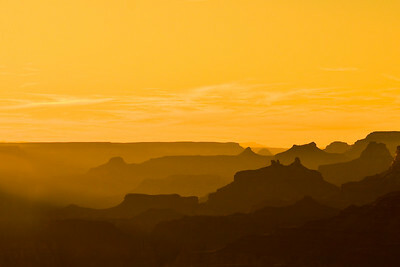 Likely my favourite of my Grand Canyon sunsets. This is a panoramic view, with some glorious sun rays lighting up the array of peaks, lining up behind each other. 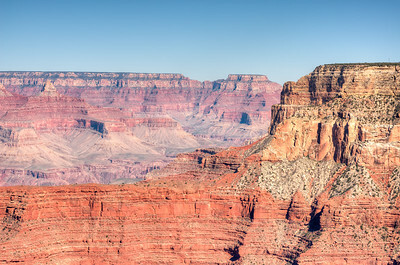 Taken from Desert Point. 2017. A little more of an abstract image. 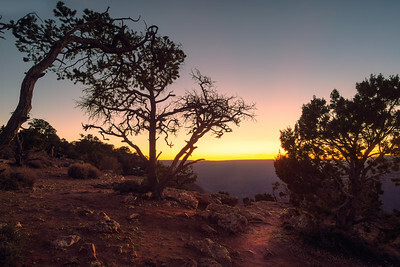 Taken at the top of Desert point with the sun setting nicely over the horizon, fighting up the tangled web if branches in these pitiful looking trees. Grand Canyon, 2017. We stood up here for maybe two hours shooting, and with my young son cutting about, I'm surprised I wasn't more anxious about the big drop from this point. The light on the sandy surface was very nice, lit up by the setting sun at Desert Point. 2017. 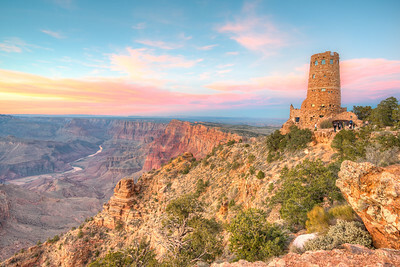 A magnificent sky overlooking Desert Point in the Grand Canyon. Note for any photographers shooting here; you may notice the shadows creeping up deep int he valley and about to block the best light. Don't pack up. She of the best light comes when those shadows have progressed to the rim. 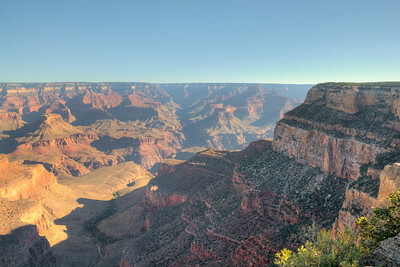 As with the prior image, this one was taken after the golden light have been replaced by shadows. 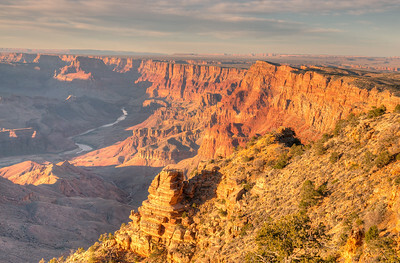 But....it made for less contrasting conditions which mean the fantastic detail at Desert Point can easily be photographed in co junction with the warm sunset colours in the sky. 2017. 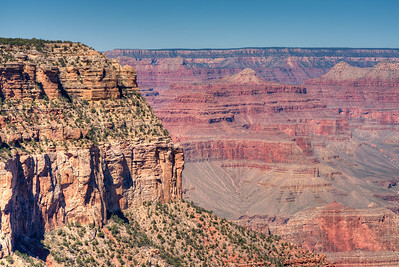 Another view of the Battleship; the very distinctive rock formation that can be seen from the Grand Canyon South Rim. 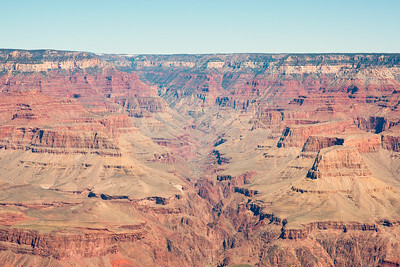 This is a long lens shot, an example of the non-expansive shots of the canyon which can be just as captivating as the big landscapes. 2017. 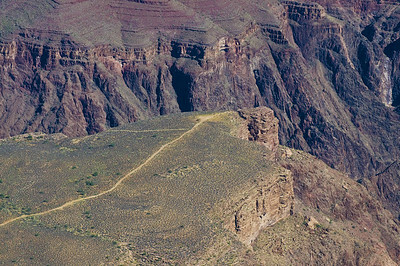 I like this Grand Canyon South Rim image because of the somewhat soothing looking contours which line this valley beneath the Village. This is a very common view, being at the center of the tourist hotspots. 2017. 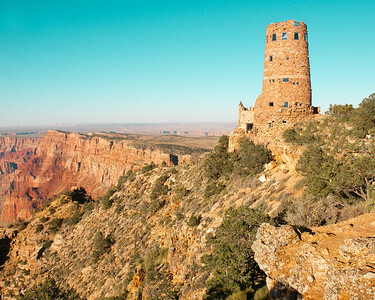 Thi is the other side of the Grand Canyon, across from the South Rim. I like this image, not just because it offers a deep (long lens) view of the more obscure scares on this landscape, but because this image is nearly 20 miles away, which can barely be believed. 2017. 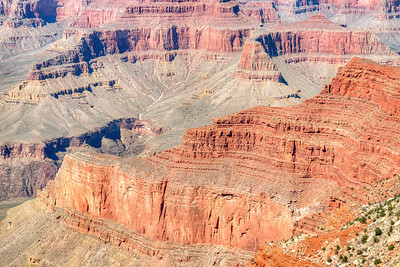 Another great type of image to take in the Grand Canyon - contrasting cliff faces, accentuating the fine detail in each. 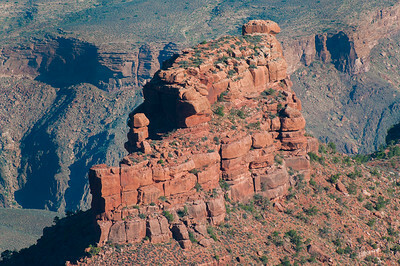 In this, each cliff face is maybe 15 to 20 miles apart. Really speaks to how vast this place is. 2017. A long tree happily growing where there appears to be little potential for its roots to grow. 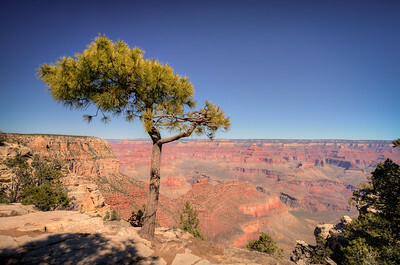 Note that the width of the canopy is generally an indicator of how far the roots have spread - these Grand Canyon South Rim tree roots are certainly on the move. 2017. 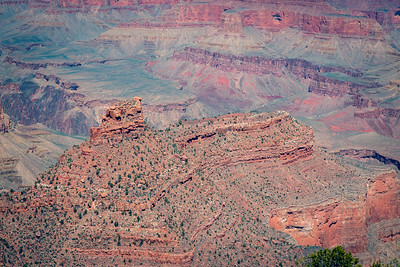 Another view of the South Rim Battleship rock formation - this one I bumped up the sharpness to really bring out the detail -which was entirely the point of they particular Grand Canyon image. 2017. 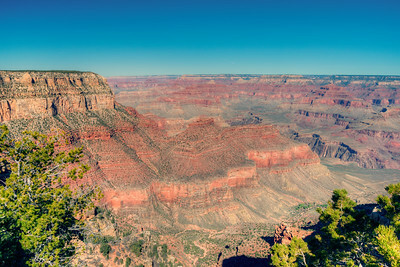 This Grand Caynon combines a couple of my favourite types; those that accentuate the the fantastic detail in the rock formations, and those that use the vast expansive space in the canyon to create depth in the image. 2017. 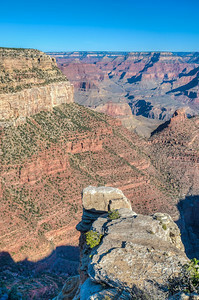 Taking photos of the Grand Canyon during the mod-day light is a challenge - there are lots of harsh shadows cast by the huge sandstone cliff faces. 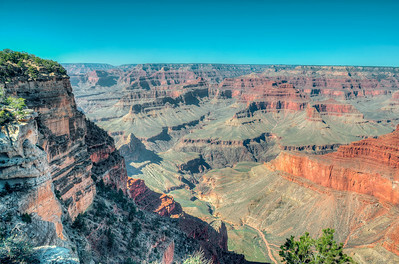 HDR photography is sometimes require to make sense of the resulting image. 2017.